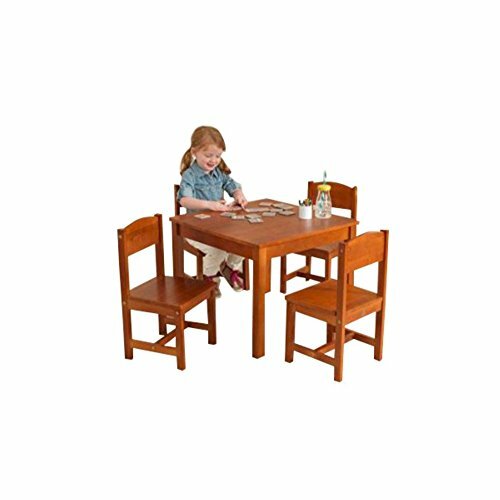 KidKraft Farmhouse Kids 5 Piece Table and Chair Set. Give your kids the right table training with the KidKraft Kid's Farmhouse 5 Piece Table and Chair Set. This table and chair set include a square-shaped table and four chairs. It is available in a variety of finishes to choose from. Constructed using birch wood, this table and chair set is strong and durable. It is ideal for kids in the age group of three to eight years. The Kid's Farmhouse 5 Piece Table and Chair Set from KidKraft requires assembly. This table and chair set is non-toxic and safe for kids and has a general conformity certification. Wipe this table with a clean, damp cloth to maintain its fresh finish for years to come.